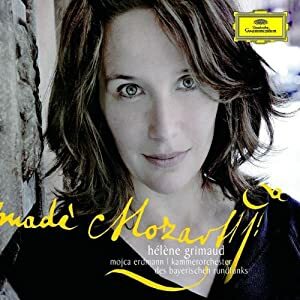 Pianist Hélène Grimaud will release a new album of Mozart concertos and a Mozart concert aria on November 8, 2011 for Deutsche Grammophon. In her 23-year career, Grimaud has recorded works by Rachmaninoff, Chopin, Brahms, Gershwin, Beethoven, and Bach, but this CD marks her first full-length foray into Mozart and her only recording of Mozart besides her fiery 2010 interpretation of Sonata No. 8 on her most recent disc, Resonances. Of Grimaud's interpretation of the Mozart sonata in live performance, The New York Times wrote, "Staccato passages were forbiddingly crisp, and shifts from ornamental passages back to the melody strongly emphasized." Known for her poetic sensibility and fiercely personal performances, Grimaud has been drawn to Mozart in recent years by the kinship she feels they share. She writes in the liner notes to this upcoming album, "This element of passion which gives sense to our existence is always there with him.” The Mozart concertos disc was recorded live with the Bavarian Radio Chamber Orchestra in May, with an additional studio recording of the concert aria with soprano Mojca Erdmann. The album opens with the Piano Concerto no. 19 in F Major. The rhythmic piece highlights Mozart's incredible range with the militaristic first movement contrasting with the airy gentle second movement. The last movement of the work has been called among Mozart's best. Grimaud writes that this exhilarating section is, "Very virtuosic, alive and effervescent. But this manic energy is almost an escape into a trance: it is not only joy, it is not only happiness.” The disc continues with the aria Ch’io mi scordi di te? – Non temer, amato bene, which Grimaud calls, "Gorgeous. It’s like liquid gold, the piano’s interventions going from something to do with silk to something to do with lace." The album concludes with Piano Concerto no. 23 in A Major, a piece with vocal coloring and operatic tone. Grimaud considers the concerto in A major, "Probably the most sublime concerto Mozart ever wrote," with a slow movement that is "an extremely deep and painful expression of longing, where you find the real Mozart."